I have been thinking for some time I wanted to get a new Bible. I was not sure of the translation, just knew I wanted to get a new one. Then, not too long ago the Names of God Bible arrived for me to review! This version of the Bible is God’s Word and it was written to offer a translation of the Bible that translated the Bible from the Hebrew, Aramaic, and Greek texts to their closest natural English language. I found this version very readable for my boys and myself to read and understand. 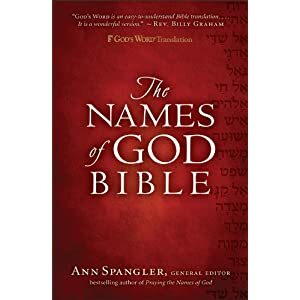 I already own the companion book by Ann Spangler Praying the Names of God, which I have loved to use for study time. Pairing both of these books together is a great asset to any home, homeschool, or church library. This Bible has been a joy to our family! We usually each read in the morning at the kitchen table. Each of my older boys and my husband and myself are reading through the Bible this year (well the boys are not reading the entire OT). Since this Bible arrived someone is reading it each morning, whether I get to grab it first, or one of the boys manage to get it. They love how each time the Bible uses God or Lord there is a more specific reference such as Elohim, Elyon, Yahweh, or for Jesus they use Yeshua. We have found this a great Bible to have if we want to dig just a bit into the literal meaning of the names. Especially with the companion book, you can look up what the name literally means and why it is used in that context. As my boys get older and start to really dig into the Word of God I know this will be an awesome reference to have! I am already planning that next year we will study each of the names together for part of school – and work through the companion book along with the Bible to get a better understanding of the Names of God! NOTE: I received a copy of THe Names of God Bible from Revell Publishers, at no cost, in exchange for an honest review.